Felting—the creation of a uniquely dense textile fabric by matting, condensing, and pressing wool fibers together—is an ancient art, but when it is practiced by today's crafters, felting is very often done in a modern automatic washing machine. A standard top-loading washing machine with its agitator is perfect for roughing up wool fibers so they bond together. But increasingly, homeowners are opting for new front-loading washing machines, choosing these machines for their eco-cred (they use a lot less water than a conventional top loader). Because front-loaders operate differently and have no agitator, many crafters think they are out of luck when it comes to felting. But this is just a popular misconception; the truth is that felting is not any more difficult to felt with a front-loading washing machine—you just need to bear a few things in mind. Top-Loader Vs. Front-Loader: What's the Difference? First, a few definitions. Most people, in America at least, own top-loading washing machines, meaning that the lid is on the top of the appliance and clothes are loaded into the machine from the top. These machines have an agitator that sticks up into the cavity of the machine. This makes felting in a top loader quite easy because the machine helps rough up the knit fabric, which is one essential element of effective felting. Front-loaders, on the other hand, typically have a door on the front that opens outward. They don't have an agitator in the cavity—there is just a big empty space where you put in your clothes. These machines perform their cleaning action when the barrel rocks back and forth to agitate the garments. The clothes are never fully submerged, and the design means that there is much less water used in the washing/rinsing cycle. Owning a new front-loader might sound like bad news if you're used to felting in a top-loading machine. Without fully submerging a project in hot water and giving it tons of agitation, how is it possible to felt a knitted fabric? Another potential hindrance to felting with a front-loader is that these machines usually lock when in operation, which means you can't check your project in the middle of a cycle. That makes the whole process that much scarier and out of your control. Actually, though, you don't need to worry too much about either of these "problems." In fact, other than the inability to check your project partway through the process, felting in a front-loader is pretty much identical to felting in a top-loader. First, knit the piece as you normally would for any other type of felting. That means using a bigger knitting needle than the yarn calls for, and making the project bigger than you want it to turn out. To determine exactly how much bigger, you'll need to make and machine-felt a sample swatch in the same manner you plan to use when felting the project itself. Weave in all ends securely and do any sewing that needs to be done on the knitted piece. 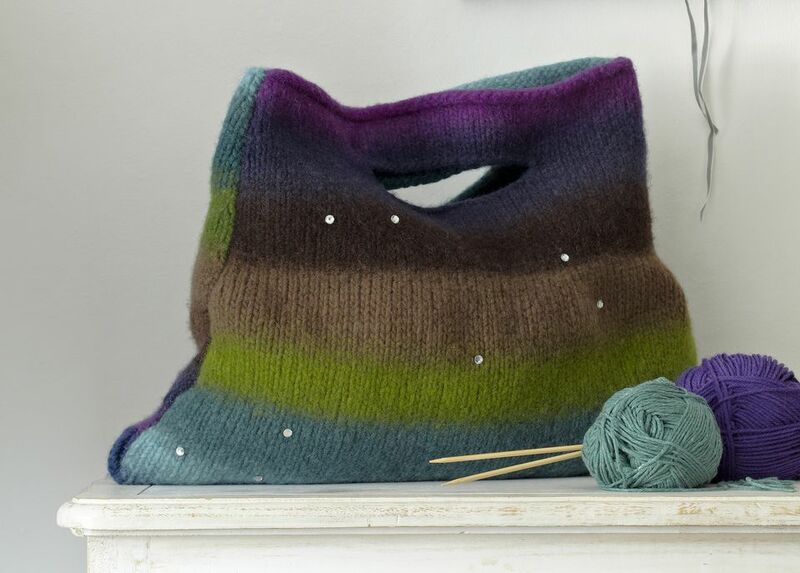 Put the item to be felted in a large zippered pillowcase (or in one that is tied closed) and add it to the machine. It's normally not necessary to add a towel or anything else to the load to amplify the agitation, but if you find that felting is a very slow process in your machine, you might want to try this. Add a tiny bit (perhaps a teaspoon) of wool wash to the detergent dispenser. Run a short cycle with hot water and a cold water rinse. If your machine has an option to drain the machine without spinning, use that, but a gentle spin shouldn't be a problem. On many machines, the whole cycle takes about 30 minutes. At the end of the cycle, remove the item and examine it to determine if it's felted enough. If not, run it through again in the same way. When done, roll the item in a towel to remove as much water as possible, then use fresh towels to form the piece to the shape you want as it dries. A piece that is under-felted may exhibit a bit more stitch definition than you like. If so, you can remedy this with another cycle in the machine. That's the beauty of felting: You can always keep going by hand or by machine until you get the look you like—so long as you don't take it too far.